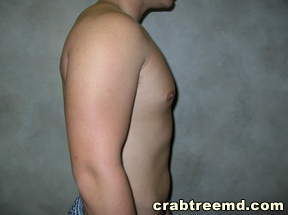 Description: Tumescent Liposuction with SmartLipo Laser on male breasts. 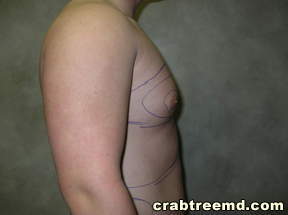 Retired several years ago so I decided to have several liposuction procedures performed by Dr. Crabtree to get my abdomin, love handles, and chest area flattened out. This unique and effective procedure was painless and only required a local so I was able to drive home after the procedure. Recovery time was quick and within days I was able to return to my daily activities. I would highly recommend this procedure and if my body ever needs flattening out again Dr. Crabtree and his staff will my first contact to have this procedure performed again. Excellent overall experience and my results exceeded all expectations. Dr. Crabtree and his staff have always been very professional and friendly. Dr. Crabtree does excellent work and I HIGHLY recommend. For those looking for a doctor that has the expertise in the field, Dr. Crabtree is the best person for the job. You will not be disappointed. Every morning I look in the mirror and I'm EXTEMELY happy with my results. Go for a consult and you will be happy you did!! This past May my son was getting married. I worked on getting my stomach pooch down through exercise. It wasn’t working. Dr. Crabtree preformed liposuction on me and immediately I saw a major difference. I took it easy for a few days but went back to work and people remarked the difference it made. I was able to get in my dress for the wedding! I highly recommend Dr. Crabtree. He is so compassionate and caring about his patients. The procedure was really a breeze. But I will say, don’t think you are going to go in as a 60 year old woman and come out with a 40 year old body. We still have our same body! This is just a great enhancement. What exercise, a good diet and weight training couldn't do, Dr. Crabtree and his Team DID DO. In one consultation, Dr. Crabtree educated me, made me laugh and reviewed the whole process with me before I made a decision. An educated approach that made me feel like came to the right place. Dr. Crabtree is so knowledgeable and I went in for lip injections and they looked so beautiful!! Amazing experience! Friendly and knowledgeable family staff. Dr. Crabtree bent over backwards to help me and I couldn't be happier with my results! Highly recommend! The moment I walked in the door I was treated like family!! I found Dr. Crabtree to be extremely knowledgeable he answered all of my questions. I decided to proceeded with the procedure (LIposuction and sculpturing under my chin and neck. It made a huge improvement, very little downtime. The next time you’re in his office asked to see my pictures I give permission. I had a great experience with services at Liposuction Institute. I had an area of fat on my abdomen that I wasn't able to get rid of with diet or exercise. The procedure was painless and you fully awake. I was very pleased with the results. I would highly recommend! Content 2017 Liposuction Institute of Louisville. All Rights Reserved.